Children are often terrified when it’s time to go for their next dental checkup. It’s very important for a child to become familiar with the dental clinic early. Most children who fear dental treatments are the ones who are rarely taken for regular checkups. When a child gets used to the normal cleaning and a basic routine procedure, it’s going to be easier for them to deal with a more extensive treatment when that time comes. There are several of techniques that can be used to make a child more comfortable during a dental treatment. If a child is having a hard time, verbal communication may work. Simply techniques like voice and tone control can make the child feel at ease so that the dentist can accomplish treatment. In situations where the child is having a very hard time and resisting treatment, pharmacologic methods may be administered. Most dentists are allowed to administer sedation up to a certain extent. 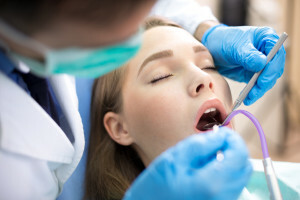 In some cases, the dentist anesthesiologist may be used to administer sedation or any other complex techniques that may be required to help a child cooperate. Anesthesiologists are trained to administer different levels of sedation to children. Your dentist may require a permit to give sedation depending on the state regulations. There are even cases where the patient will be placed under general anesthesia in order to cooperate and for treatment to be administered. The medications used for sedation may vary depending on the child and the situation. It may also have some side effects which vary. For the young children, it’s very hard to predict the effects of oral medication given to them prior to administering dental treatment. The dosage is also very important because children will react differently based on the amount of medication given. Even though getting anesthesia is considered safe, there are some risks associated with sedation. For patients who conditions like sleep apnea or obesity, anesthesia should not be considered unless a doctor is consulted. This is because some conditions will put patients at risk of developing complications from anesthesia. When administering anesthesia, the dentist can only give a safe dosage. If the child fails to react to that dosage, it cannot be increased in order to be more effective. Overdosing can cause severe problems. It is also important to ensure that the dentist is trained and well qualified to administer the type of sedation that your child will be receiving.